Power [Toolz] to the Women! ToolGrrlz is the hub ~ all things toolz just for us grrlz. We are your resource for empowertoolment through, education, information, workshops, projects and inspiration. Because if there is one thing every grrl should know it's how to wield her power toolz! We absolutely love this project by Dream Book Designs. Not only is it a rockin’ project but they have a full ‘how to’ to go along with it. Check out the full tutorial here. We have quite a few large empty walls as well and might just need to make one of our own! Like many unfortunately-coiffed DIY-minded youths in the early ‘00s, I found an undeniable allure in designing my own t-shirts. The ability to emblazon self-designed images, jokes or political messages on one’s own clothes seemed a bit like modern-day alchemy. 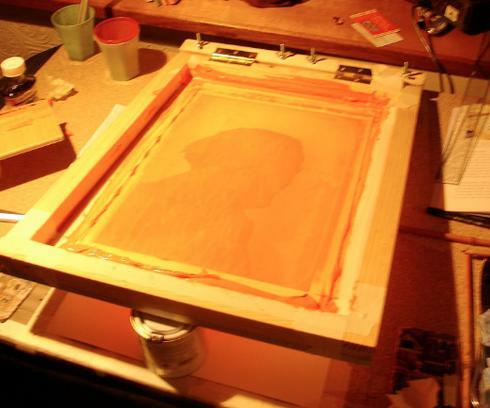 I was already familiar with the easy but flawed methods: stencils, which didn’t allow for fine detail, and printer t-shirt transfers, which flaked off after a couple of washes. The preferred method was clearly screen printing, but how-to books and online FAQ’s were mystifying. Finally an artist friend taught me the basics, but it took months of trial and error before I really got a feel for the process. Which is why screen printing co-ops are such as the Austin Screen Print Cooperative (ASPCO) and Chicago’s Spudnik Press are a brilliant concept. Founded on the premise that art should be a democratic and empowering medium, Spudnik Press Cooperative is committed to providing a print shop that is approachable and affordable; a space where professional printmakers merge with aspiring students; a space that encourages collaboration and the sharing of ideas. At Spudnik Press, artists create and use printed materials to further culture and engage with their community. Through sharing materials, equipment, and studio space, artists are also sharing technical skills, practical knowledge, and creative processes. By pooling resources and creative problem solving, artists at Spudnik Press are able to create a space that is beyond the means of solo emerging artists. By extending our programming to include exhibitions, classes, free workshops, and drawing groups, we are able to reach beyond the print community and engage with the community as a whole. We ran across this awesome sled on Inhabitat’s website (which we absolutely love and highly recommend!) One of the ideas which is dear to our hearts is that of up cycling – or re purposing. We love finding items which would otherwise end up in the landfill and see them turn into fabulous new designs. Christmas trees are a prime example of a single use item…use em, love em, toss em…well not any more! Designer Tom Hatfield has created gorgeous and functional sleds using found branches from Christmas trees brought to the curb around his native London. The purposeful rough-hewn effect is achieved with “bodging,” a traditional (if not primitive) woodworking technique where branches are used as is, and left untreated as “green” wood…Love it! Click on the image to see hi site…the Blooming Bench also rocks our world! We think that this table is aces! Always on the hunt for new project ideas…and also stuff that we think is super cool, we found this House of Cards table by Brazilian designer-architect Mauricio Arruda. “To manufacture the table, a process of laser cutting was used. This technology created a perfect reproduction of a deck of cards in scale 13:1. Subsequently, steel cards were welded one to one forming a second‐story house of cards that serves as an under frame. These frames feature a versatile look to the piece, since they are capable of supporting different sized tabletops. The design options were made to accommodate form 6 to 10 seats . The images of the playing cards are printed individually in the plates of steel, which allows each table to have a different configuration, becoming single pieces. They are assembled like a house of cards in a real cards game, where each piece is drawn randomly.” Not necessarily something that we are going to be making in the garage any time soon but very cool nonetheless! We think that this is a great idea and would love to see something like this spring up here in SO CO. Now really is the time to create a less disposable society…and have fun while you are at it! Fixers’ Collective is a social experiment in improvisational fixing and mending. The Collective meets every Thursday from 6 – 9pm at Proteus Gowanus, on the corner of Union & Nevins, in Brooklyn, N.Y. Everyone is welcome. Bring us your broken things, and we’ll help you fix them. Or just bring yourself, and help us fix other people’s stuff. When we get our office HQ together this just may need to be in it. How cool is this table we found at Freshome…although in our opinion, there is no such thing as a useless tool.